Opals are beautiful gemstones, supposed harbingers of bad luck, and perhaps the only thing to come out of Australia that won’t kill you. According to new research from a team of British researchers, however, they’re also adding some sweet bling to a meteorite recently found in Antarctica. Beyond looking cool, the opal-studded meteorite also offers new clues about the origins of life on Earth. The findings, unveiled today at the 2016 National Astronomy Meeting, are important because opals are associated with water—their structure contains up to 30 per cent of the precious, life-forming substance. 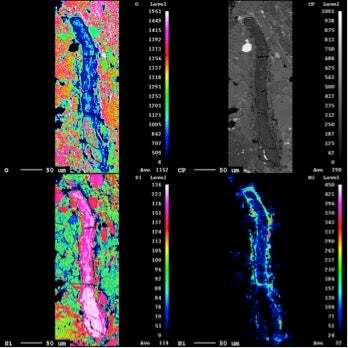 The discovery of the opal-laden meteorite adds further fuel for the theory that water found its way to Earth on the backs of asteroids. According to the Royal Astronomical Society, opal had previously only been found once in a meteorite. This new little guy, called EET 83309, has pieces of different meteorites embedded within it, which suggests that its parent asteroid was pummelled by other pieces of rock. Hilary Downes, a professor of geochemistry who led the findings, suggested one of those collisions introduced water ice to the asteroid, which then led to formation of the opal. Scientists have long wondered how and when our water supply formed, and recent findings suggest that it actually arrived far earlier than originally thought. While the full story is still incomplete, evidence suggests water came from asteroids, not comets, which had also been put forth as a possible source.